Prime Minister Tony Abbott and Defence Minister Senator David Johnston have announced that current Vice Chief of Defence Force (VCDF) AIRMSHL Mark Binskin will be promoted to Air Chief Marshal and will succeed GEN David Hurley as Chief of Defence Force (CDF) in the next command rotations in July. Binskin joined the RAAF as a Mirage pilot in 1983 after transferring from the RAN where he had been an A-4 pilot. He went on to be one of the initial cadre of RAAF F/A-18A pilots before progressing through various air combat, project and operational command positions throughout the 1990s and 2000s. After serving as Air Commander (ACAUST) from 2006 to 2008, he succeeded AIRMSHL Geoff Shepherd as Chief of Air Force from 2008 to 2011. Chief of Air Force AIRMSHL Geoff Brown has been extended in his position for another 12 months, as has Chief of Army, LTGEN David Morrison. 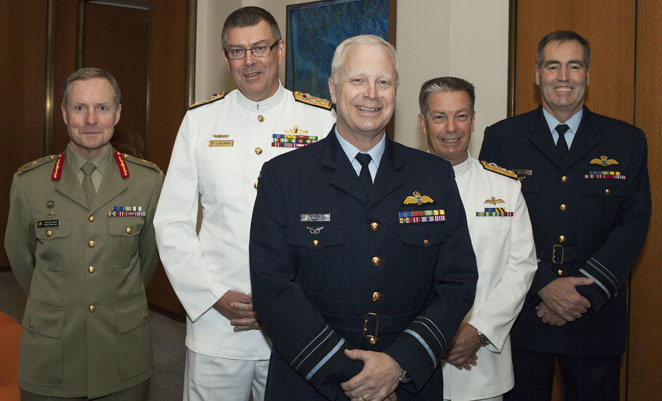 Former Chief of Navy VADM Ray Griggs will take on the role of VCDF, while Navy’s current Commander Australian Fleet (COMAUSFLT) and former Navy pilot, RADM Tim Barrett will be promoted to Vice Admiral and will become Chief of Navy. PM Abbott also announced that all service chief positions have been extended to four year terms, up from the current three years. Served with Tim Barrett in a posting at HMAS Albatross. Great man for the role. Congratulations.